Henley Honda | Community | 2 Months and 8000+ km…by Bicycle! 2 Months and 8000+ km…by Bicycle! For almost two months and over 8000km, Daniel Corso and Tanner Cookson of St. Catharines will travel from the west coast of Canada to the east coast, on only their bicycles. Yes, you read that right – 8,000km on bikes! The pair of lifelong friends are teaming up to fight Lyme Disease head-on with their RIDE FOR LYME campaign. The Ride For Lyme will be almost a 2 month journey and will see the pair average about 140km each day. Daniel and Tanner, who both rowed competitively for their universities (Northeastern and Trent, respectively) are no strangers to an endurance challenge, but this will undoubtedly test their strength and resolve. The goal of this coast-to-coast ride is to create more awareness and bring more attention to the many Canadians who suffer from Lyme Disease as a result of the inadequate care that Provincial health care suppliers provide. Lyme disease is a borreliosis caused by borrelia bacteria, which commonly infects woodland animals. Ticks pick up these bacteria from biting the infected animals, and then pass it on to humans when they latch on. For decades, people have been improperly tested for disabling disease which has been an under-reported, poorly recognized serious threat to the health of Canadians. As time passes, both treatment and diagnosis become more difficult, and symptoms worsen during each stage of infection (there are 3 stages). Symptoms can range from flu-like feeling to neurological illnesses, including paralysis. 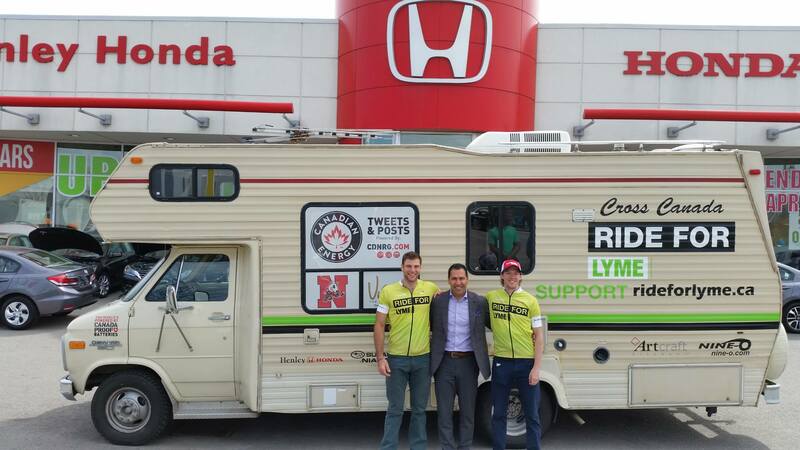 Henley Honda is proud to support the RIDE FOR LYME and the effort to spread awareness about Lyme Disease and hopefully influence change in Canada regarding the disease. If you’d like to donate, all you have to do is CLICK HERE TO DONATE. To hear more about their story and learn more about their coast-to-coast adventure, head on over to their website at www.rideforlyme.ca. We are extremely proud of Daniel and Tanner, and wish them all of our best and will be sending them positive vibes throughout their trip! Good luck, guys!